It’s difficult to refer to any highlights on this disc because each track is superb. The arrangements are brilliant. Chick Corea’s La Fiesta and Spain open the CD with high energy and a Latin pulse that flows naturally into Bernstein’s Selections from West Side Story. America will positively launch you from your seat. One Hand, One Heart is movingly simple. Each selection is a gem. Die Anschlagskultur und rhythmische Präzision dieses Duos sind beeindruckend…. Selten hat ein stilistischer Crossover derart gegrooved und so viel Vergnügen bereitet wie diese SACD…..Den Namen Bergmann Duo sollte man sich in jedem Fall merken. A beautifully programmed and executed disc. 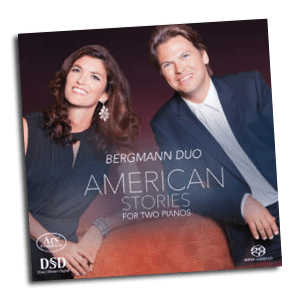 All arrangements are by Marcel Bergmann, and are the height of taste, executed with great imagination…..The sheer level of pianism is remarkable in this performance, two pianists listening and reacting to each other so intently they emerge as one super-pianist. A remarkable disc, the entertainment value of which is huge. But there are lessons to be learned if one listens carefully, both as regards the art of the pianist and, equally, the art of the arranger.